RMB did his graduate studies in phycology (the study of algae)Phycological Society of America with Professor Harold C. Bold. There he learned how to grow and analyze soil and airborne algae. He also learned to use the electron microscope, and in 1959 made his first electron micrograph of a Golgi Apparatus. 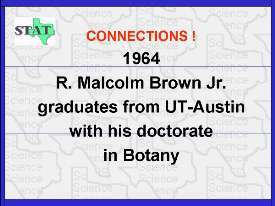 Dr. Hilton Mollenhauer taught him electron microscopy.